The Tongariro Alpine Crossing spans the length of Mt Tongariro (19.4Ks) and takes about 7-9 hours. You start from the Mangatepopo Valley and walk over towards the Ketetahi road end as this will minimise the climbing involved. We guide the Tongariro Alpine Crossing all year and every day mother nature allows us a safe and enjoyable passage. 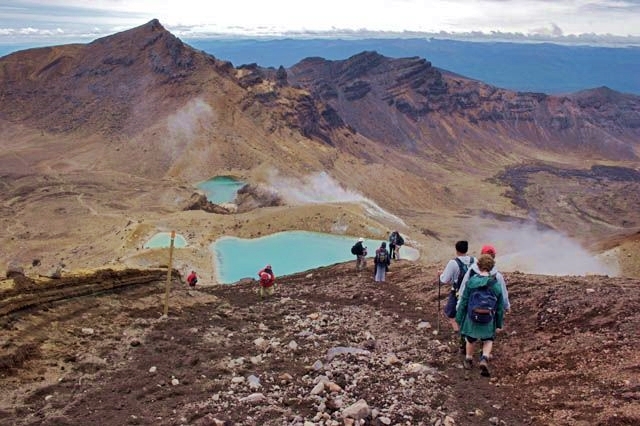 Winter Guided Tongariro Alpine Treks are from 1st June-31st Oct. The route follows the same route as in summer. We can pick up from your accommodation in either, National Park Village, Taupo, Turangi, or Whakapapa Village, if prearranged (surcharge applies). The Group price includes:-A guide to customer ratio of maximum 1:10 (generally 1:6-8) crampon & ice axe, meeting at our base at 7.30am with return transport to our base at approx 5pm and a well earned refreshment at the finish. We have a great range of quality outdoor :- clothing, boots, and equipment designed for winter conditions. Minimum number for a group is 4 people but you dont need to worry about that we will put you into a group if you are an individual. You need no experience and you do not need to have any out door clothing or equipment, we provide and give guidance on the use of all equipment and any gear or clothing needs for a safe day out. We limit our trips sizes to a maximum of 4 guides and we like to mix the groups so that everyone gets to enjoy the day regardless of their age ability or fitness.